Here is the back of the sweater so far. I just love it. 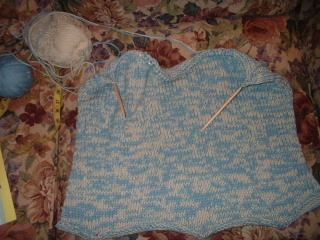 Here's the thing though... the more I work on it, the more I think it really looks like a "Kelly" sweater. Kelly is my oldest daughter. This looks like something she would love. I have to be STRONG. This one's for ME! It's going so fast I can always make another one for her. If I could stay away from socks long enough this sweater would probably be finished by now. I'm thinking this pattern would look great in Lion Brand Landscapes yarn. Like I said before, I'm not TOO much of a yarn snob. I wonder if Landscapes qualifies as a bulky yarn. I would imagine it does. Has anyone knited anything with Lanscapes? I just love the colors.